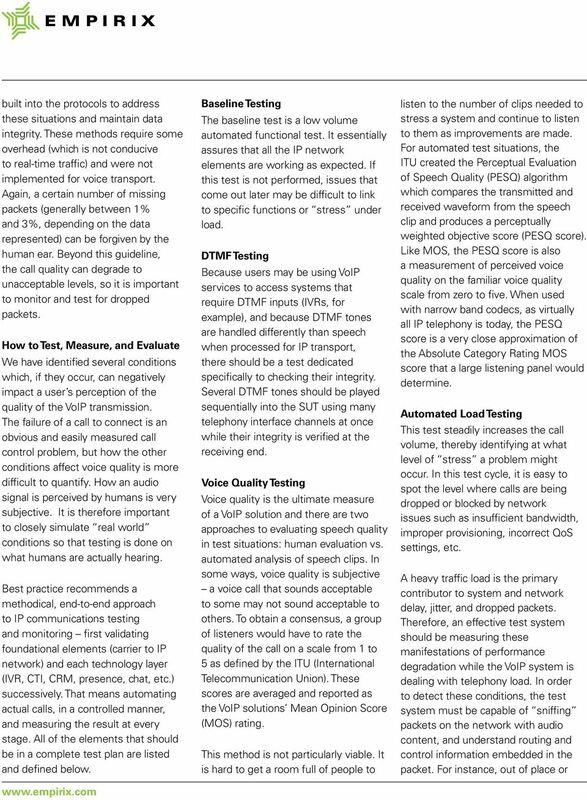 Download "Quality of Service Testing in the VoIP Environment"
2 Carrying voice traffic over the Internet rather than the traditional public telephone network has revolutionized communications. Initially, voice over IP (VoIP) simply promised to dramatically lower long distance charges. Today, because of the broad acceptance and implementation of SIP, it is significantly more interesting. Along with voice traffic, a SIP-based IP network can simultaneously handle , video, chat, text, and more. It enables smooth integration with both contact center systems (IVR, CTI, routing, etc.) and enterprise applications (CRM, ERP, knowledge bases, skills tables, etc.). Additionally, IP communications has given birth to a new piece of information, presence, which tracks each user s availability status and how best to contact them at the moment (text, phone, , etc.). 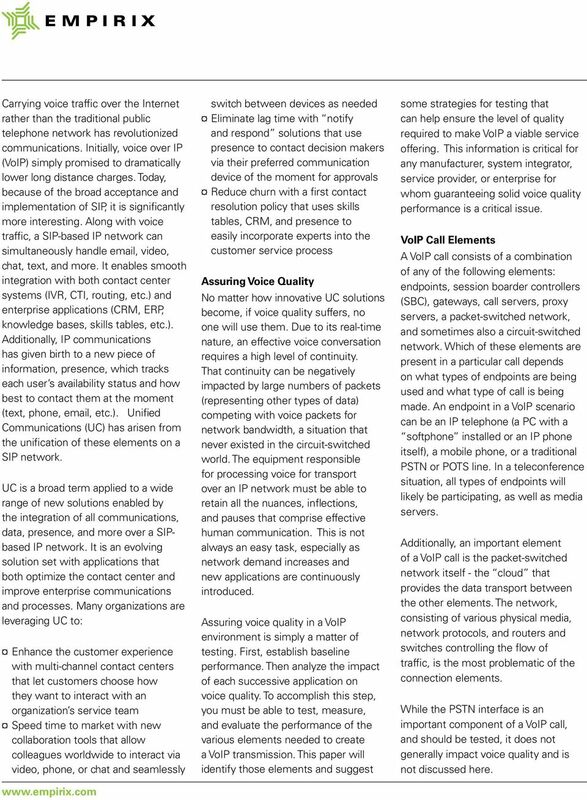 Unified Communications (UC) has arisen from the unification of these elements on a SIP network. UC is a broad term applied to a wide range of new solutions enabled by the integration of all communications, data, presence, and more over a SIPbased IP network. It is an evolving solution set with applications that both optimize the contact center and improve enterprise communications and processes. 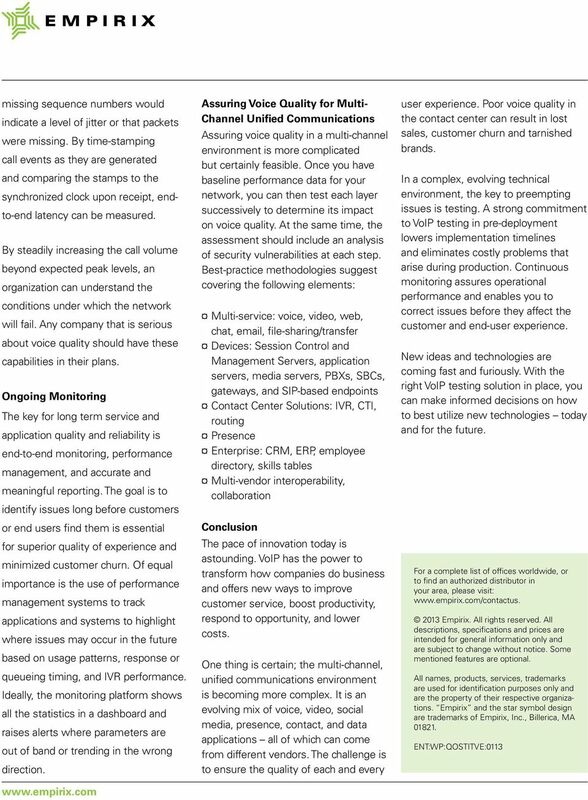 Many organizations are leveraging UC to: Enhance the customer experience with multi-channel contact centers that let customers choose how they want to interact with an organization s service team Speed time to market with new collaboration tools that allow colleagues worldwide to interact via video, phone, or chat and seamlessly switch between devices as needed Eliminate lag time with notify and respond solutions that use presence to contact decision makers via their preferred communication device of the moment for approvals Reduce churn with a first contact resolution policy that uses skills tables, CRM, and presence to easily incorporate experts into the customer service process Assuring Voice Quality No matter how innovative UC solutions become, if voice quality suffers, no one will use them. Due to its real-time nature, an effective voice conversation requires a high level of continuity. That continuity can be negatively impacted by large numbers of packets (representing other types of data) competing with voice packets for network bandwidth, a situation that never existed in the circuit-switched world. 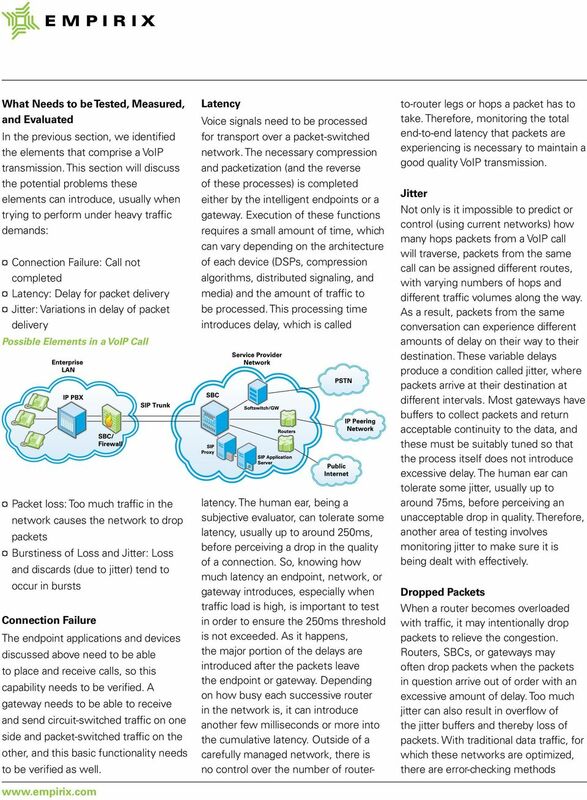 The equipment responsible for processing voice for transport over an IP network must be able to retain all the nuances, inflections, and pauses that comprise effective human communication. This is not always an easy task, especially as network demand increases and new applications are continuously introduced. Assuring voice quality in a VoIP environment is simply a matter of testing. First, establish baseline performance. Then analyze the impact of each successive application on voice quality. To accomplish this step, you must be able to test, measure, and evaluate the performance of the various elements needed to create a VoIP transmission. 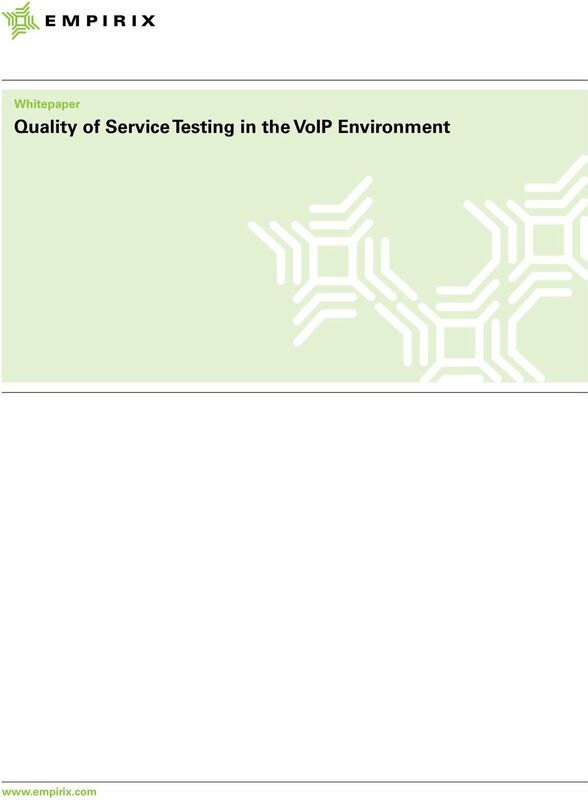 This paper will identify those elements and suggest some strategies for testing that can help ensure the level of quality required to make VoIP a viable service offering. This information is critical for any manufacturer, system integrator, service provider, or enterprise for whom guaranteeing solid voice quality performance is a critical issue. VoIP Call Elements A VoIP call consists of a combination of any of the following elements: endpoints, session boarder controllers (SBC), gateways, call servers, proxy servers, a packet-switched network, and sometimes also a circuit-switched network. Which of these elements are present in a particular call depends on what types of endpoints are being used and what type of call is being made. An endpoint in a VoIP scenario can be an IP telephone (a PC with a softphone installed or an IP phone itself), a mobile phone, or a traditional PSTN or POTS line. In a teleconference situation, all types of endpoints will likely be participating, as well as media servers. Additionally, an important element of a VoIP call is the packet-switched network itself - the cloud that provides the data transport between the other elements. The network, consisting of various physical media, network protocols, and routers and switches controlling the flow of traffic, is the most problematic of the connection elements. While the PSTN interface is an important component of a VoIP call, and should be tested, it does not generally impact voice quality and is not discussed here. Packetized Telephony Networks Benefits of Packet Telephony Networks Traditionally, the potential savings on long-distance costs was the driving force behind the migration to converged voice and data networks. Introduction SIP is fast becoming the Voice over IP protocol of choice. During this 3-day course delegates will examine SIP technology and architecture and learn how a functioning VoIP service can be established. ATA: An Analogue Telephone Adapter is used to connect a standard telephone to a high-speed modem to facilitate VoIP and/or calls over the Internet. Goal We want to know. Introduction. What is VoIP? Carrier Grade VoIP. What is Meant by Carrier-Grade? What is Meant by VoIP? Why VoIP? Knowledge Is Power: Do what s best for the client. VoIP 101. E911-Enhanced 911- Used for providing emergency service on cellular and internet voice calls. Application Notes. Introduction. Contents. Managing IP Centrex & Hosted PBX Services. Series. VoIP Performance Management. Overview. Gen2 Ventures White Paper Clearing the Way for VoIP An Alternative to Expensive WAN Upgrades Executive Overview Enterprises have traditionally maintained separate networks for their voice and data traffic. ACD: Average Call Duration is the average duration of the calls routed bya a VoIP provider. It is a quality parameter given by the VoIP providers. Network administrators must be aware that delay exists, and then design their network to bring end-to-end delay within acceptable limits. Application Notes. Introduction. Sources of delay. Contents. Impact of Delay in Voice over IP Services VoIP Performance Management. 5. DEPLOYMENT ISSUES Having described the fundamentals of VoIP and underlying IP infrastructure, let s address deployment issues. On-Demand Call Center with VMware A VMware 5 and Mitel Unified Communication Practice KEY BENEFITS Leverage infrastructure consolidation and desktop virtualization to deliver instant call center architecture. ALCATEL CRC Antwerpen Fr. Wellesplein 1 B-2018 Antwerpen +32/3/240.8550; Suresh.Leroy@alcatel.be +32/3/240.7830; Guy.Reyniers@alcatel. ehealth and VoIP Overview Voice over IP (VoIP) configurations can be very complex. Your network could contain a variety of devices, applications, and configuration capabilities to support voice traffic.